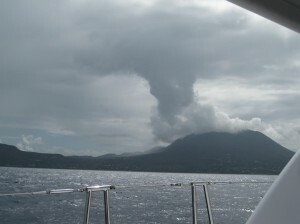 Nevis - will have to wait for next time! Well for those who would not know a Code Zero…. let me introduce you to it: it is a huge extra sail with a lot of limitations as far as wind direction and wind strength is going (This EXTRA addition to the family of sails is over and above the other EXTRA sail we already have added…the Gennekar and the standard EXTRA sail called the Genoa that comes with the MAIN sail!! !…I mean …how many sail do you need to get a boat going?). The Code Zero is a toy for speed….like the case is with these testosterone driven devices – they are not well thought through! Anyway …Code Zero and its time depriving nature has robbed me from setting foot on Nevis as we were running out of time to get through the night sail to Martinique! I am sorry about that but at least I hope this has released the bee in the Captain’s bonnet and resulted in the Captain to let the sleeping Code Zero lie…. St Kitts and our trip around the Island on a double decker train!…ending it with a great meal at Rawlings Estate!